Super Mario Maker for Nintendo 3DS is a Nintendo 3DS port of the 2015 Wii U title Super Mario Maker. Despite being a Nintendo 3DS game, it is only playable in 2D. It was initially released in December 2016, roughly 15 months after the Wii U version. The game includes almost everything from the original Wii U release, with the exception of the Costume Mario and Big Mario forms and searching for courses by code. It is also possible to play stages from the Wii U version, though not every stage is compatible with the 3DS version due to version differences, such as the removal of Mystery Mushrooms and Big Mushrooms from the 3DS version. Exclusive to Super Mario Maker for Nintendo 3DS, the game includes 100 new courses designed by Nintendo pre-installed. The courses also include medal objectives, in which the player must fulfill certain criteria, such as collecting every coin in the level, to earn a medal. Players can also send unfinished courses to other players, by way of Local Play, and they can team up, or collaborate, on stages. Stages made in this way have a special icon marked next to it. The editing mode of the game also includes Yamamura's Lessons, an interactive tutorial guided by Mary O. and Yamamura. The Super Mario Challenge (called Challenge Courses in the Coursebot) is a challenge mode containing 100 levels. It has Challenge Medals to collect that come in handy for accessing the 19th world. The 100 levels are divided up into 19 worlds. However, Princess Peach is taken to World 18. The player needs to go through 88 of the 100 levels to rescue Peach. World 19 is unlocked in the Coursebot when she is rescued. The first level in World 19 is dependent on collecting 40 Challenge Medals. The actual mode has the player starts out with 10 lives, but they can increase it to 100 lives. If the player has a Game Over, the player has to restart from the beginning of the world they are on. Lives gain or lost in the Coursebot don't change the lives in the mode. After rescuing Peach, the player can redo the whole entire thing again if they want to with altered text for completing World 19. The Super Mario Challenge mode also features a map that has 18 worlds. The number of levels start at four (Worlds 1-7, 10-12, 14-16), increases to six (Worlds 8 and 13), then increase to eight (Worlds 9, 17 and 18), and finally to twelve (hidden World 19) with the color of the world map background gradually changing as well (with the exception of World 19 which is exclusive to Coursebot). The are two types of Challenge Medals that can be collect through the playthrough or Coursebot for each level. Nintendo mentioned some of these challenges in trailers before the game came out. The first medal is the Goomba Challenge Medal. It is available on the first time play. The second harder medal is the Bowser Challenge Medal. This one doesn't show up until either it is completed or the Goomba Challenge Medal has been earned. The Bowser Challenge medal can be either a more advanced form, a total opposite, or a non-related challenge of the Goomba Challenge Medal. Assist Items are items that could appear when the player loses five lives. The player can choose not to accept the item, but they would be asked again if they lose five more lives. If the item is activated, the Challenge Medal would become unobtainable. Assist Items can't be activated past the checkpoint as it too removes the possibility of collecting Challenge Medals. After the player rescues Peach, the credits roll while Mario walks. There are coins at the top-left corner possibly meaning lives added. When Mario enters the castle, the score of all 88 levels is totaled. After that, a "To be continued..." message appears due to the player needing to play the 19th world for some bonus stuff. Mystery Mushrooms; the Weird Mushroom replaces the Mystery Mushroom as the game theme-specific power-up in the Super Mario Bros. game theme. Without Mystery Mushrooms, amiibo figurine support and Event Courses have been consequently removed from the game, and clearing 100 Mario Challenge will no longer reward a costume. Without amiibo figurine support, scanning the Super Mario Bros. 30th Anniversary amiibo will no longer summon a Big Mushroom. Cat paws and its other hand tones. Course IDs and all courses that involve the Mystery Mushroom and/or Big Mushroom items (although the player can download Wii U courses from the internet and participate in the 100 Mario Challenge). Additionally, searching via the Super Mario Maker Bookmark portal site has been removed from the Nintendo 3DS version. Checkpoint Flags, Skewers, and Keys are now standalone course elements, meaning they no longer need to be created by shaking an arrow sign, a Thwomp, or a P Switch, respectively. The Super Mario Bros. 3 and Super Mario World game styles. The Underwater, Airship, Ghost House, and Castle course themes. Mario's trail display, the timer and autoscroll settings, the sound effects menu, and the ability to create sub-areas. Donut Blocks, Fire Flowers, 1-Up Mushrooms, Lifts, Cheep Cheeps, Bloopers, Spike Traps, Semi-Solid Platforms, Checkpoint Flags, the game style specific power-ups (Weird Mushrooms, Super Leaves, Cape Feathers, and Propeller Mushrooms), Super Stars, Bill Blasters, Dry Bones, Fire Bars, Burners, Hammer Bros., and Tracks—however, Coins, Trampolines, Piranha Plants, Warp Doors, Boos, and Bowser can no longer be turned into Pink Coins, Sideways Trampolines, Fire Piranha Plants, P Warp Doors or Key Doors, Boo Buddies, and Bowser Jr., respectively, until certain points. Coins can no longer be turned into Pink Coins until all of the secret World 19 courses have been cleared. Trampolines can no longer be turned into Sideways Trampolines until World 9 of Super Mario Challenge has been cleared. Piranha Plants can no longer be turned into Fire Piranha Plants until World 4 of Super Mario Challenge has been cleared. Warp Doors can no longer be turned into P Warp Doors or Key Doors until Worlds 12 and 18, respectively, of Super Mario Challenge have been cleared. Boos can no longer be turned into Boo Buddies until World 9 of Super Mario Challenge has been cleared. Bowser can no longer be turned into Bowser Jr. until all of the secret World 19 courses have been cleared. Rocky Wrenches can no longer be turned into Monty Moles until World 6 of Super Mario Challenge has been cleared. Buzzy Beetles can no longer be turned into Buzzy Beetle Shells until World 15 of Super Mario Challenge has been cleared. Spinies can no longer be turned into Spiny Shells until World 16 of Super Mario Challenge has been cleared. Grinders can no longer be turned into Bumpers until World 16 of Super Mario Challenge has been cleared. Koopa Clown Cars can no longer be turned into Fire Koopa Clown Cars until World 18 of Super Mario Challenge has been cleared. The Nintendo 3DS version has seven item interface columns with nine items each, as opposed to its Wii U predecessor, which has five columns with twelve items each. Also, there is no longer a crown column, and all items completely fill each column. The Nintendo 3DS version supports the ability for different players to collaborate on courses together via Local Play. Players can share their courses with other players via Local Play or StreetPass, rather than uploading them. There are fewer buttons when searching online courses. 10 Mario Challenge has been replaced with Super Mario Challenge, which consists of 100 courses designed by Nintendo in 18 different worlds. Half of the 60 course elements are unlocked at the start, compared to the Wii U version, which has a set of elements unlocked at a time each day. When placing an object down in the course creator, instead of a distorted voice saying the name of the object, there is simply a small sound that sounds like two sticks tapping each other. It is no longer possible to record custom sound effects. Upon starting the game for the first time, the player no longer needs to play though an unfinished course and a guided tutorial before being able to access the Main Menu. Instead, the player is greeted with an introductory speech from Yamamura and Mary O. The letters on the title screen can no longer be tapped due to them being on the top screen. For this subject's image gallery, see Gallery:Super Mario Maker for Nintendo 3DS. NOTE: This glitch only works on the New Super Mario Bros. U game style. For this glitch, the player must have a Bowser Jr. and a Koopa Clown Car, regardless of which type it is. When Bowser Jr. takes any form of damage or is far away from Mario, he hides into his shell and starts speeding towards Mario. If he falls into a Koopa Clown Car while inside his shell, his head will be jammed inside, giving somewhat of a headless appearance. There is also another way to experience this glitch by using a Spiny Shell on Mario. When Bowser Jr. hides into his shell, the player should wait until he jumps back out to attack. When he is in mid-air, Mario needs to run under him so he takes damage. When he jumps from the damage, Bowser Jr. is headless for a second before retreating into his shell. It is recommended to use Big Bowser Jr.
Nintendo 3DS Jose Otero, IGN 7.2/10 "The core idea behind Super Mario Maker is the ability to create, play, and share your creation, but the 3DS drops the ball on the last part of that credo. It’s worth noting that designing stages is as easy at it is convenient on the portable 3DS, but not having a larger platform to showcase unique creations left me wondering what the point is. It’s still an excellent way to play a bottomless pit of classic-style 2D Mario, though, and that makes it worth keeping in your pocket." 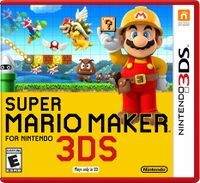 Nintendo 3DS Thomas Whitehead, Nintendo Life 9/10 "Super Mario Maker for Nintendo 3DS doesn't match the Wii U original in terms of visual polish or amiibo support, nor does it have the vibrant online scene that defined that title. Despite this, there are smart design choices that compensate for these inevitable shortcomings, with additions that enable quicker and more educated level design, along with Super Mario Challenge, a large set of official levels that's more structured and enjoyable than equivalent modes in the HD iteration. For those without a Wii U, Super Mario Maker for Nintendo 3DS is a no-brainer, as it's a lot of Mario on one cartridge and a terrific creative toolset. For those with a Wii U it's a tougher call, as the HD original offers smart online features and sharing, even though the portable iteration offers a strong offline and solo playing experience. On its own merits, however, avoiding those comparisons, this 3DS version of an elite Wii U title deserves plenty of credit - it's a big success for small screens." Nintendo 3DS Jed Whitaker, Destructoid 6/10 "If the 3DS version would have came out prior to the Wii U version, I think we would all feel very differently about it, but that isn't the case. While the main features are there, the lack of online rips the heart out of the game making it little more than a glorified way to play a random selection of levels, most of which aren't very good, even with Nintendo's curation. On the other hand, the 100 included levels from Nintendo aren't to be missed if you want some of the best Super Mario Bros. levels released to date; they just aren't worth the $40 price tag alone. Super Mario Maker for 3DS isn't a bad game or even a bad creation tool, but without its online heart continuously pumping life into it, it feels more like a useless skeleton, and nobody likes skeletons. NOBODY." By way of a glitch or a possible developer oversight, it is possible to spawn Mystery Mushrooms using a Big Magikoopa. Touching the Mystery Mushroom will turn Mario into Small Mario with the same abilities as Super Mario. This is no longer possible after the version 1.03 update. The New Super Mario Bros. U template lacks the same quality as in New Super Mario Bros. 2, which is also a Nintendo 3DS game. 3D elements do not have anti-aliasing effect, and 2D elements are blurrier than in the original game featuring the same art style, being more akin to the original New Super Mario Bros., for the original Nintendo DS. ↑ 2.0 2.1 2.2 Nintendo. (September 1, 2016). Nintendo Direct 9.1.2016. YouTube. Retrieved September 1, 2016. ↑ Nintendo AU NZ. (September 2, 2016). Super Mario Maker for Nintendo 3DS announcement. Twitter. Retrieved September 2, 2016. ↑ Nintendo UK. (May 23, 2018). Nintendo Selects - more Nintendo 3DS fun!. YouTube. Retrieved May 23, 2018. ↑ (January 15, 2019). Super Mario Maker, Majora's Mask 3D, and Star Fox 64 3D Become 3DS Nintendo Selects - Siliconera. Siliconera. Retrieved January 15, 2019. ↑ Nintendo. (November 17, 2016). Super Mario Maker 3DS - Overview Trailer (EN). YouTube. Retrieved November 17, 2016. ↑ GameXplain. (November 8, 2016). Super Mario Maker 3DS - Overview Trailer (JP). YouTube. Retrieved November 8, 2016. ↑ NintenDaan. (November 17, 2016). (Mario Maker 3DS) Intro Gameplay. YouTube. Retrieved November 30, 2016. This page was last edited on April 3, 2019, at 18:51.